As I was turning off the computers after class this morning, Filifili rattled the door knob and said, “Ummm… Mister?” As I walked around turning off the uninterruptible power supplies, panic began to set in, and when I was done with all my stuff, I walked over to try the door. The kids clearly had hoped I had a magical remedy for opening it, but I had nothing. I turned the knob and pushed and pulled and nothing happened. Panic! I scheduled class for today because Marie requested it during our one-on-one yesterday. She surfaced the idea as a time to go over the common exam, but then immediately followed the suggestion by saying, “I hate staying home on Saturday.” It’s unclear how much studying she wanted to do and how much she simply wanted to get out of the house, but I figured it wouldn’t hurt, and hell if I had anything to do. The day was uneventful until the door incident. I’m having a difficult time recalling if it was me or Filifili who was last to close the door. Phil called me about 5 minutes before I ended class, and I stepped outside to answer my phone. And I think Filifili might have come in after that. It was a little unclear as to why he’d come at all since he’s not in my computer class and no other teachers held class today. Whatever. My first inclination was to kick through the door. There were four strapping Samoan young men in our ranks, and I had no doubt that the four of them and my puny frame could collectively ram through the door. But then I thought about explaining the broken jamb to my pule and having no security for my computer lab for the next 48 hours, and I figured ehhh… maybe we shouldn’t kick the door in. We all had cell phones though, and I figured bringing another adult into the picture might do some good. I dialed my pule and handed my phone to Filifili to do the talking. My pule sent his 9-year-old son Atonio and one of the 4-year-old twins to bail us out. No matter the scope of the fe’au, best to send a tamaiti. The seven of us (Me, Filifili, Marie, Tui, Sione, Sinaumea, and Sisigafua) stood at the window and watched Atonio and his little sister trudge across the field toward the lab. 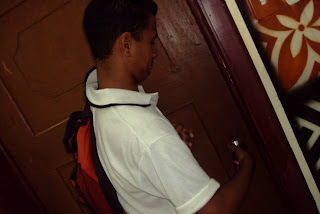 When they got there, Atonio put the key in the lock and turned it and nothing happened. The door had never been locked though, so this solution seemed doomed from the beginning. It became clear we were going to have to break out ourselves. In a MacGuyver-style fit of brilliance, someone disassembled a set of nail clippers out of the lost-and-found clutter on my desk and tried futzing with the door. I let the boys go at the problem while I snapped photos. Marie, at one point, stood on a stool and pretended she was going to jump off and plow through the door. Goof ball. After a while I felt guilty and took my turn at the door. I was able to use a part of the nail clippers like a small crow bar, and pry part of the jamb off. This was my only contribution to our escape, but it proved vital. Sinaumea took over for me finishing off the prying, and then he and Filifili and Sione all seemed to be picking at the lock from different angles. And in a show of trademark Samoan collectivism the three of them got the door to swing open. Everyone cheered. The ordeal took roughly 35 minutes, and we enjoyed the extra time with the air conditioner. I was able to padlock the door without letting the latch catch. We should really get someone to look at that. Standing at the window waiting for Atonio. Filifili and Tui attend to the door. Sisigafua stand behind. Marie is doing who-knows-what? 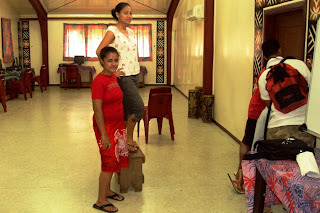 Marie and Sisigafua pose while the boys work on the door. Yay! I loved this post. How rude of blogger not to post it. You so funny Matty. "No matter the scope of the fe’au, best to send a tamaiti." Love it, love it.